Excellent quality rosin with great playing results. Made in England. Excellent all purpose violin resin for Violin/Viola/Cello/Double bass. Popular violin resin stored in felt bag for multi purpose use on violin/viola/cello/double bass. 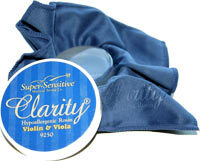 Hypo-allergenic Rosin for violin by Super-Sensitive Musical string co. Very good quality Cello resin (6C).